Ebooks we have published with name meanings. 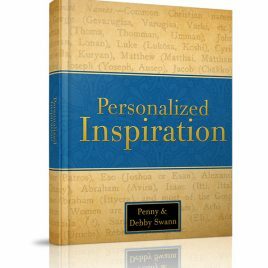 The Personalized Inspiration line of our name histories is the bookmark line. We create a bookmark using your name, its inherent meaning, and a scripture chosen from the King James Version of the Bible to inspire you. An inherent meaning is a quality or trait that comes with your name rather than its actual meaning. For example, Peter means, “The Rock.” Inherently, Peter means, “Steadfast, Strong, Unmoveable.” The names in the book are alphabetical and are not separated by gender. You can use the information for all sorts of fun, especially crafty fun! We've seen people create family tree charts, t-shirts, name tags for Thanksgiving, signs for baby's room and more. The possibilities are as endless as your imagination! This book was first published in 2011 on Amazon for Kindle (and is still available there, if you prefer). We have written many more bookmarks since then. If you have purchased the ebook for a project and need info on a name that we have since written as a bookmark (see the pdf list of bookmarks that are written under personalized inspiration), contact us and we will give you the information (with proof of book purchase). If not, you will need to purchase the name in order for us to do the research for you. Enjoy!